This is not the first of these jungle cactus (epiphyllum) that I have posted on my blog, but at 7 o’clock this morning, the amazing bloom certainly helped brighten up the day. I could be grumpy about so many things this morning. I spent the third night without AC. Thankfully, with the tile floors downstairs and all the ceiling fans downstairs stays relatively comfortable and with the windows open and box fans pulling in air I can sleep upstairs at night. Tomorrow I will plunk out the money for a new AC system I’m keeping the furnace even though the AC company would have liked me to have pulled out everything. There are way fewer days where we need to have the heat on here in southeast Texas in comparison how much we use the AC. Last night was the first night I have stayed in my house without Annie. I took her to stay with my neice until the new AC is in. The temperature was only up to about 90 yesterday, but I just didn’t want her to get too hot if the thermometer goes up higher today. Also with the workers in and out tomorrow putting in the new AC, my house wouldn’t have been a good place for her. I even plan to get myself out of the way once they are working. So because of the heat and not having Annie there, I woke up early and decided to crank up the computer, only to find out about all the senseless deaths in Colorado. I really don’t understand how people can be opposed to more stringent gun laws. I think most people get wiser with age, but obviously that is not universal. In my opinion, we would be much safer and saner today if strong gun control and legalized marijuana had been made law back in the 1960s. With those thoughts on my mind, no dog to feed and give some lovin’, and a little extra time before having to get myself on the road to work, I had a chance to take in the grass that I had quickly mowed last evening and all the plants and flowers that are thriving after the 12th straight day of rain (.25 in. yesterday). 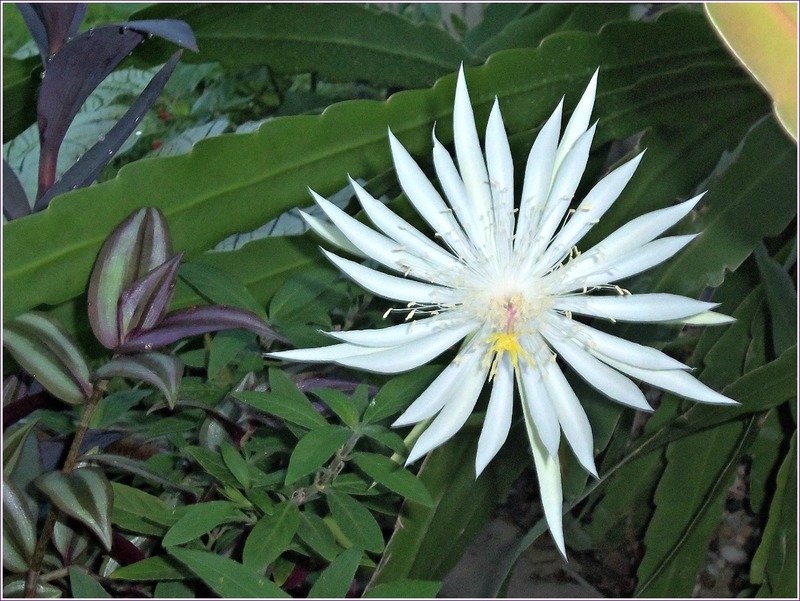 On another day, I might have missed this amazing jungle cactus (white epiphyllum). But there on the other side of the barbeque grill, in full glory, popped out this wonderful flower, only the third one so far this year. Had I not spied it this morning, it would have been completely wilted by the time I arrived home.